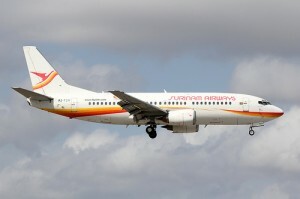 PARAMARIBO - Surinam Airways (SLM) was out of the red and made a profit during the period when Robbi Lachmising was CEO. He was reappointed CEO of the company last year. Sitting in his office on a bright sunny day in the tropics, Lachmising outlined his vision for the airline, which includes improvement of services, fleet renewal and partnership with other carriers. And while he spoke modestly about route expansion, Lachmising is keen in getting SLM out of the red, but he is also ambitious to expand SLM’s Guyana hub from its current three destinations – Miami, Orlando and Paramaribo – to five. Two destinations on his radar are Havana and New York City via Guyana. According to Lachmising, the aviation industry in Guyana will grow and the Georgetown hub will continue to expand, especially now that Guyana will soon be a major oil producing country. SLM will approach the government of Suriname to help finance its fleet renewal. Another major need of the airline from the government is help in securing air agreements and partnership with other carriers. As the national carrier of Suriname, SLM argues that with the support of the government and, in particular, the ministry of transportation and tourism and foreign affairs, the national carrier can grow. Suriname is very much behind in securing air agreements with some important countries such as Ghana, the UAE, Turkey, Cuba and Panama. Its air agreement with Colombia is very restrictive and experts have suggested that it should be renegotiated. Decades ago, Caribbean Airlines (CAL) and Air Jamaica turned SLM away when it sought partnership with those carriers. Today, Air Jamaica doesn’t exist and CAL is still in the red. SLM later entered some agreements with an Antillean carrier and KLM. Today, one of the major goals of SLM is to forge partnerships with other airlines. In a major development last week, SLM and the European carrier, TUIfly, announced a code-sharing partnership. The two carriers will fly five-times weekly between Amsterdam and Paramaribo. Four of those flights will be operated by SLM and one by TUIfly using SLM’s Airbus 340 and TUIfly’s Boeing 787 Dreamliner. However, during peak season TUI will increase its frequency to two. Under the agreement, TUI will buy 80 seats each on two of SLM flights. The agreement has a life of three years. Then both companies will evaluate the partnership, and maybe move to a stronger agreement like what SLM had with KLM, Lachmising said. Also, TUI will charter SLM’s Airbus 340 to use on other routes. TUIfly, with a fleet of nine aircraft, including three Dreamliner 787s, may enable SLM to move in the direction of twin-engine aircraft (ETOPS) certification to ply the mid-Atlantic route. With ETOPS certification, SLM can use modern and cost efficient aircraft such as the Boeing 767 / 787 and the Airbus 330 / 350. The government of Suriname is seeking an air agreement with Turkish Airlines and the foreign ministers of both countries met in Istanbul in 2016. The foreign minister of Suriname, Niermala Badrising, delivered a proposal to her Turkish counterpart. Since then, the two companies met in Miami last year. However, there has been no movement in negotiations. SLM is waiting on Turkish Airlines for a follow up meeting. There is a need for government intervention and a starting point for an initial agreement between SLM and Turkish Airlines may fall under Suriname’s membership in the Islamic Development Bank (IsDB), an organ of the Organisation of Islamic Cooperation (OIC). Turkish Airlines and Islamic Bank signed an MOU in which the Turkish Airlines will provide “aviation training” to members of the bank. SLM is looking to incorporate two to three new aircraft to replace the three aging Boeing 737-300s currently in its fleet and that depends on the government of Suriname concluding air agreements with countries such as Guyana and Cuba. SLM is seeking fifth freedom rights to carry passengers between Guyana and Havana and between New York City and Georgetown. These are some of the factors that will affect the choice of aircraft renewal and route expansion, according to Lachmising. “Guyana doesn’t have a national carrier, and we would like to be the flag carrier of Guyana,” Lachmising said. SLM’s Guyana load factor has increased by 65% since it returned to Georgetown in 2012. SLM was solicited to return to Guyana by the previous administration after Delta abruptly left Guyana. The government of Guyana at that time had no issue allowing SLM fifth freedom rights to any destination of its choice from Georgetown. More specifically, Guyana has been calling on SLM to add New York to its network. Lachmising wants to improve the airline’s “product” across the board, from ground handling, customer and inflight services. Just recently, SLM improved its inflight entertainment system on the mid-Atlantic routes by offering the latest American and Bollywood movies. The airline has already earned a good name for its fine inflight services. Its meal service is one of the best offered by any Caribbean based airlines. Its meal and beverage services surpass Caribbean Airlines (CAL) which basically serves a processed turkey and cheese sandwich wrapped in plastic and, when heated to be served, looks really unattractive. This is served to Guyanese passengers travelling from New York to Georgetown. Guyanese passengers contribute to the bulk of CAL’s revenue.